Do you like Crazy Zoo? Share it with your friends. 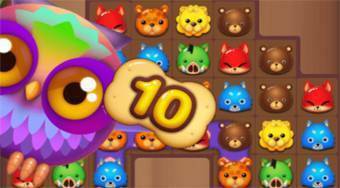 Crazy Zoo is a very catchy logic game where you have prepared a large portion of a hundred and twenty different levels of difficulty. In each round, combine at least three of the same animals and earn money to remove them from the board. To advance to the next round, you must collect the required number of prescribed animals and also upload the required number of points.